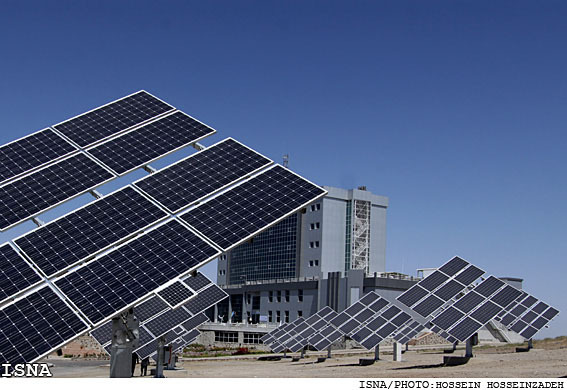 Iranian President Mahmoud Ahmadinejad has approved drawing 500 million Euros out of the National Development Fund to develop renewable energy projects, IRNA reported on Saturday. Deputy Energy Minister Mohammad Behzad told IRNA that the sum will be paid to small developers in the form of loans. The National Development Fund - which is currently valued at $35 billion - was set up by Ahmadinejad's government last year (March 2011-March 2012) to tap 20 percent of oil and gas revenues for social investment. Iran is projected to export as much as 10 billion kilowatt hours (BkWh) of electricity in the current calendar year, compared to 8.6BkWh in the past year, Behzad said on April 30. He noted that the value of electricity exports has increased by 40 percent since the beginning of this year, which began on March 20, in comparison to the year before, the ISNA news agency reported. A number of countries, including Pakistan, Turkey, Iraq and Armenia have signed new deals to boost electricity imports from Iran, he said. Behzad said on April 4 that the Energy Ministry had prepared plans to increase electricity generation capacity of national power plants by 5GW this year. "Over 10,000 megawatts should be added to the generation capacity of hydroelectric and thermal power plants by August 2013," he added, the Fars News Agency reported. By the end of the Fifth Five-Year Economic Development Plan (2015), Iran will boost its electricity generation capacity by 25GW to reach 73GW, Energy Minister Majid Namjou said on February 7. Iran currently exchanges electricity with Turkey, Armenia, Turkmenistan, Azerbaijan, Pakistan, Afghanistan and Iraq.